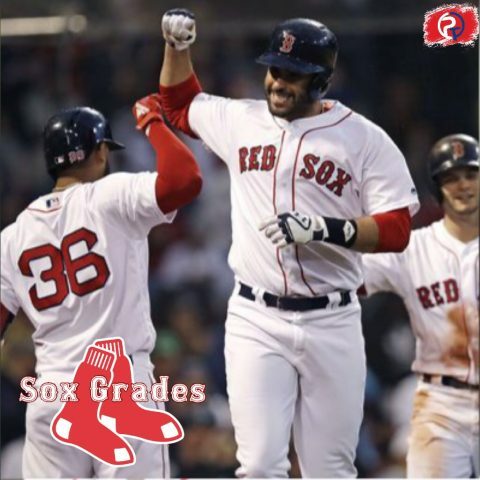 In this installment of Sox Grades, our two panelists decided to attack both the catcher and the designated hitter positions. One grade was easy, and the other three were a collective trash heap. Too bad for Blake Swihart, but one of our panelists didn’t even think enough of him to garner a grade. Let’s get started, with perhaps the easiest grade of the year. Jeremy: J.D. was everything the Red Sox dreamed he would be and more. Not only did he do his best to fill a David Ortiz-sized hole in the lineup, but he also helped the rest of the Sox with their swings. Even with people’s insistence that Tim Hires was the difference with the hitting, I think it was J.D.’s philosophy that paid the most dividends to create the most dangerous lineup in the game last year. Martinez is the only guy I will give a perfect score too; he just kept producing. Jordan: Who cares about rationale? J.D. was everything to the 2018 Red Sox. Sandy Leon was lucky he was some of the Red Sox staff’s personal pacifier. That was the only logical reason that he appeared in as many games as he did. He was just so bad, it was unfathomable. One of the funniest parts of the whole playoffs was when he singled in the World Series, and everyone in the room watching with me burst out cheering at a 66 mph ground ball down the first base line. God, I miss 2016 Sandy Leon. Jordan: The quicker I get this over with, the better my responses for the other guys will be. Leon was great with the pitching staff, but I think any of us responding would’ve done more offensively than him at times. No. Seriously. He was riding an 11-116 in the second half, and I might go as far as to say he was hot at that time. Pitiful, but good defensively. Jeremy: Am I the only one shocked that Christian Vazquez had a worse WAR than Sandy Leon this year? But hey, at least he’s immortalized for not only hitting a 315-foot moonshot to win Game 4 in New York and got the personal pleasure of plunking the Greatest American Hero Joe West. The catcher spot is wide open on this Red Sox team; Vazquez did everything he could to give it away, including blaming his hand guard as the reason why he broke his hand against the Royals during the season. Jordan: I’m not too mad about the regression of Christian Vazquez in 2018. Now everyone who was hyping him up as an elite-hitter because he hit .290 in 2017 can now see the beauty of what a lot of bloopers gets you. You can have a lucky season, but I’m genuinely shocked if you can replicate it. That being said, there’s a reason he took over catching David Price in the playoffs. And there’s something to build off of in that 2018 postseason offensively for Vazquez, especially since he hit a ball off of Zach Britton in Game 4 against the Yankees that hasn’t landed yet. That being said, he gets the same grade as Leon for this one. Jordan: Y’all are going to kill me for this one… But I liked what I saw from Blake Swihart last season. When he sat a ton, he wasn’t good in his chances. But when he got a consistent chance to play, he started playing well. And as much as you hate seeing teammates go down, I’m sure Blake thinks the injury to Vazquez was the best thing that’s happened in his career since hitting .270 in 2015. He started pounding the ball when given the chance; even riding a 10-plus game hitting streak at one point before he strained his hamstring. The Red Sox settled at less than $1 million in arbitration with him, and I don’t think they’re planning to move him. Give me more Blake Swihart in 2019, please!